The results are in, and we have our Challenge 8 winners! Way to go gals, congrats on your first DT Throwdown win! Thank you to everyone who participated this time around, all the projects were outstanding and really strove for perfection. All teams outdid themselves, and we hope you will play again next round! The new theme, chosen by Delicious Doodles, will be posted tomorrow September 1. Congratulations to the winners of our 8th DT Throwdown Challenge! Congratulations everyone, great job. Can't wait for your theme for throwdown 9! *Each new DT Throwdown Challenge will be posted by 12 noon on the 1st day of the month, along with Mr. Linky. *Each DT should choose 3 participants for each challenge. We encourage you to choose different DT members each time so everyone who wants to play gets to play. Each DT member who plays may submit 1 project, for a maximum total of three projects per team. Design Teams may play with only 2 players, however each member may still only make one project for a total of two team projects. *DT participants will upload ALL of their projects onto one blog or website, such as a DT blog, and then provide a direct link to the post using Mr Linky. *Link in Mr Linky must have your DT name. *Projects must follow the posted theme criteria for each challenge. *Projects must be posted by the deadline. *Projects must contain at least 1 rubber or digi stamp image. All-digital projects are allowed. Any project, as long as it fits the theme and follows the rules, can be submitted. We encourage cards, scrapbook pages, ATC's, altered items, etc, as long as it fits the posted theme. *Participants may submit projects for more than one DT but must provide different projects for each DT represented and enter them accordingly using the above mentioned criteria. *Design Teams must provide a display banner BEFORE entering their first challenge. Banners need to be sized at 250 pixels width and up to 600 pixels height. 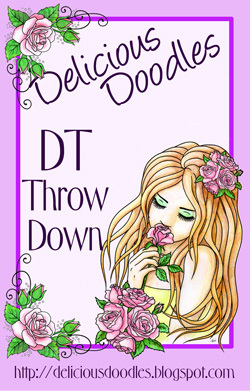 Banners should be emailed to smearedinkstamps@gmail.com, subject "DT Throwdown Banner". This banner will be used for winner display. *For each challenge entered, Design Teams will be required to email their chosen winner theme before voting ends. If your design team wins the challenge, this will be the theme for the following challenge. Theme choices should be emailed to smearedinkstamps@gmail.com, subject "DT Throwdown Theme Choice". If we don't receive your theme by the time voting ends for each challenge and you are chosen as the winning DT, we will choose the next theme. *Voting will be open for three days. One vote will be allowed per person. Design Team participants are allowed to vote. Design Teams are allowed to spread the news about the challenge to encourage more voting. *Design Teams are allowed to participate/start participating in any challenge as long as they meet the deadlines and have provided their banner. *Design Teams can be from a stamp/papercrafting company or a challenge blog and can be any size. You cannot "make up" a DT to play in the Throwdown...your team members must be from a DT on which you are currently a member.